My master bath has been in a state a from-the-ground up renovation for over a year now. With my husband and I both extremely busy with work and non-DIY things, we've only been dedicating a few hours on one weekend per month on the project. Because of that, I am currently living out of a larger Tupperware container with all my beauty products sitting next to my bed. I am craving some control of this situation since I know the master bath is not an overnight project. With that being said, the guest bathroom was the project for me to take back some control to my organization. I had already done a lot of work to the guest bathroom over the years; new floor, painted the cabinets, added framing around the mirror, and then some decorative additions. The only place that I really could take control of was in the one place that nobody could see, under the sink. That place has been a dumping ground for bathroom products for years. I thought I might find some interesting goodies under there. The space is small at only 28" x 20' x 24". There were limits to what I could do so I started my research online and used some ideas for pinterest. I ended up purchasing an under sink organizer from BBB (Bed, Bath, and Beyond) using one for their never expire coupons. It was $24.99 with 20% off so I scored it for $20 bucks. I was lucky because it was the last of its kind in the store. I can’t even find it in the store or online anymore. There is a similar one on amazon.com but it is plastic instead of metal. This organizer is the BOMB! Totally adjustable and I could do what I wanted with my existing organizing bins. It expands from 18 inches to 27 inches and comes with five adjustable clip on panels. Before I put in the adjustable organizer, I put down some shelf liner in black. It covers all the old yucks that are at the bottom and makes it look like new. The cabinet is original to the home that was built in the early 80s so I could only imagine what has been on the bottom. Once the liner was put down and the organizer got put in, I fooled around with the bins and purged what I didn’t need. Who has three things of baby powder and doesn’t have a baby? Me apparently. This made me realize that I don’t need to stock pile half the products that I have stored under there. Note to self, no need to purchase toothpaste or floss for a few months. The shelves looked awesome and then I moved on to the doors. One side was not a useable area because of the storage bins, but the other was open for some use. I needed to keep my handy dandy “freshy fresh” wipes. Seriously, you need these things in every bathroom. TMI? 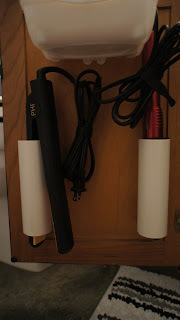 I also wanted a place to store my curling irons so I used pvc pipes, another pinned idea. I used 2” pvc pipe that we had left over from our bathroom remodel.I got the idea from here PVC Bathroom 'Holster" I cut them with the power saw. It was the first time doing it by myself and I seriously felt like I would cut off my fingers even though I followed all the rules. 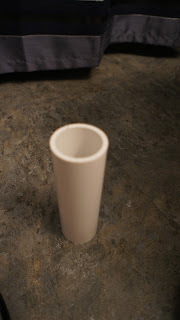 I cut the pipe about 7 inches long, but you could cut as long as you need for your own curling irons. I used double sided Scotch foam tape to adhere them to the doors. I chose to hold the chords together with Velcro cable ties instead of mounting more pipe. You could put the cord into the other pipe, but I have been totally fine with using the Velcro cable ties. So there you go, I purged, organized, and gained some control back in the bathroom department. It felt so good to organize that sink area that I WANTED MORE. Guess what area I organized next?